The literary genre of science fiction is diverse and since there is little consensus of definition among scholars or devotees, its origin is an open question. Some offer works like the Sumerian Epic of Gilgamesh as the primal texts of science fiction. Others argue that science fiction began in the late Middle Ages, or that science fiction became possible only with the Scientific Revolution, notably discoveries by Galileo and Newton in astronomy, physics and mathematics. Some place the origin with the gothic novel, particularly Mary Shelley's Frankenstein. Science fiction developed and boomed in the 20th century, as the deep penetration of science and inventions into society created an interest in literature that explored technology's influence on people and society. Today, science fiction has significant influence on world culture and thought. It is represented in all varieties of ordinary and advanced media. There have been attempts by various historians to claim an ancient history for the genre of science fiction. This claim is now a minority opinion, with the majority placing these works at best as examples of proto-science fiction. Lester del Rey has stated that the first work of science fiction was the first recorded work of literature, The Epic of Gilgamesh. Gilgamesh features a flood scene that in some ways resembles work of apocalyptic science fiction; however, it is probably better categorized as fantastic literature, as there is little of science or technology in it. Greek works with science fiction-like elements include – besides Lucian's True History – Aristophanes' The Clouds and The Birds, and Plato's descriptions of Atlantis. Early elements of science fiction are also found in ancient Indian epics such as the Ramayana, which had mythical Vimana flying machines that were able to fly within the Earth's atmosphere, and able to travel into space and travel submerged under water. The ancient Hindu mythological epic, the Mahabharatha, mentions the story of the King Revaita, who travels to heaven to meet the creator Brahma and is shocked to learn that many ages have passed when he returns to Earth, anticipating the concept of time travel. Works of fantastic literature from Ovid's Metamorphoses telling of Daedalus and Icarus to Beowulf and the Nibelungenlied to Dante's The Divine Comedy and Shakespeare's The Tempest have also been claimed to contain science fictional elements. The Tempest contains one Renaissance prototype for the mad scientist story (the Faust legend is another), and it was adapted as the science fiction film Forbidden Planet. L. Sprague de Camp and a number of other authors cite Lucian's 2nd century satirical True History about an interplanetary trip as an early, if not the earliest, example of science fiction or proto-science fiction. The position of the English critic Kingsley Amis seems ambivalent. 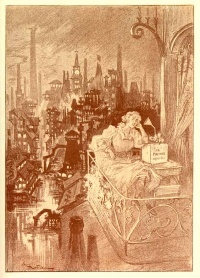 While he wrote that "It is hardly science-fiction, since it deliberately piles extravagance upon extravagance for comic effect", he implicitly acknowledged its SF character by comparing its plot to early 20th century space operas: "I will merely remark that the sprightliness and sophistication of True History make it read like a joke at the expense of nearly all early-modern science fiction, that written between, say, 1910 and 1940." Typical science fiction themes and topoi in True History include: travel to outer space, encounter with alien life-forms, including the experience of a first encounter event, interplanetary warfare and imperialism, colonization of planets, motif of giganticism, creatures as products of human technology (robot theme), worlds working by a set of alternate 'physical' laws and an explicit desire of the protagonist for exploration and adventure. The early Japanese tale of "Urashima Tarō" involves traveling forwards in time to a distant future, and was first described in the Nihongi (720). It was about a young fisherman named Urashima Taro who visits an undersea palace and stays there for three days. After returning home to his village, he finds himself three hundred years in the future, where he is long forgotten, his house in ruins, and his family long dead. The 10th century Japanese narrative The Tale of the Bamboo Cutter may also be considered proto-science fiction. The protagonist of the story, Kaguya-hime, is a princess from the Moon who is sent to Earth for safety during a celestial war, and is found and raised by a bamboo cutter in Japan. She is later taken back to the Moon by her real extraterrestrial family. 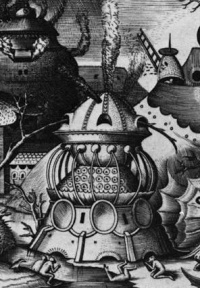 A manuscript illustration depicts a round flying machine similar to a flying saucer. Several stories within the One Thousand and One Nights (Arabian Nights) also feature science fiction elements. One example is "The Adventures of Bulukiya", where the protagonist Bulukiya's quest for the herb of immortality leads him to explore the seas, journey to the Garden of Eden and to Jahannam, and travel across the cosmos to different worlds much larger than his own world, anticipating elements of galactic science fiction; along the way, he encounters societies of jinns, mermaids, talking serpents, talking trees, and other forms of life. In "Abdullah the Fisherman and Abdullah the Merman", the protagonist gains the ability to breathe underwater and discovers an underwater submarine society that is portrayed as an inverted reflection of society on land, in that the underwater society follows a form of primitive communism where concepts like money and clothing do not exist. Other Arabian Nights tales deal with lost ancient technologies, advanced ancient civilizations that went astray, and catastrophes which overwhelmed them. "The City of Brass" features a group of travellers on an archaeological expedition across the Sahara to find an ancient lost city and attempt to recover a brass vessel that Solomon once used to trap a jinn, and, along the way, encounter a mummified queen, petrified inhabitants, life-like humanoid robots and automata, seductive marionettes dancing without strings, and a brass horseman robot who directs the party towards the ancient city. "The Ebony Horse" features a robot while the "Third Qalandar's Tale" also features a robot in the form of an uncanny boatman "The City of Brass" and "The Ebony Horse" can be considered early examples of proto-science fiction. Other examples of early Arabic proto-science fiction include Al-Farabi's Opinions of the residents of a splendid city about a utopian society, Al-Qazwini's futuristic tale of Awaj bin Anfaq about a man who travelled to Earth from a distant planet, and certain Arabian Nights elements such as the flying carpet. According to Roubi, the final two chapters of the Arabic theological novel Fādil ibn Nātiq (c. 1270), also known as Theologus Autodidactus, by the Arabian polymath writer Ibn al-Nafis (1213–1288) can be described as science fiction. The theological novel deals with various science fiction elements such as spontaneous generation, futurology, apocalyptic themes, eschatology, resurrection and the afterlife, but rather than giving supernatural or mythological explanations for these events, Ibn al-Nafis attempted to explain these plot elements using his own extensive scientific knowledge in anatomy, biology, physiology, astronomy, cosmology and geology. For example, it was through this novel that Ibn al-Nafis introduces his scientific theory of metabolism, and he makes references to his own scientific discovery of the pulmonary circulation in order to explain bodily resurrection. The novel was later translated into English as Theologus Autodidactus in the early 20th century. Literature that resembles modern science fiction emerged in Europe from the 16th century. The discoveries in the sciences and the dawning of the Enlightenment inspired literature informed by these advances. One of the earliest instances is the superior country imagined in Thomas More's 1516 novel Utopia. More's name for a perfect world would be borrowed by many later science fiction writers, and the Utopia motif is a common one in science fiction. It is notable that More and Francis Bacon, leading humanist and philosopher of science, wrote works of proto-science fiction. Bacon's fantasy The New Atlantis was published in 1627. The Age of Reason followed scientific developments that gave speculative writers ideas for their stories. Imaginary voyages to the moon in the 17th century, first in Johannes Kepler's Somnium (The Dream, 1634), and then in Francis Godwin's The Man in the Moone (1638, arguably the first work of science fiction in English) and in Cyrano de Bergerac's Comical History of the States and Empires of the Moon (1656). Space travel also figures prominently in Voltaire's Micromégas (1752), which is also notable for the suggestion that people of other worlds may be in some ways more advanced than those of earth. Other early works of significance include the alternate world found in the Arctic by a young noblewoman in Margaret Cavendish's 1666 novel, The Description of a New World, Called the Blazing-World, the account of life in the future in Louis-Sébastien Mercier's L'An 2440, and the descriptions of alien cultures in Jonathan Swift's Gulliver's Travels (1726) and in Ludvig Holberg's Niels Klim's Underground Travels, an early example of the Hollow Earth genre. In 1733, Samuel Madden wrote Memoirs Of the Twentieth Century, in which the narrator in 1728 is given a series of state documents from 1997–1998 by his guardian angel, a plot device which is reminiscent of later time travel novels although the story does not explain how the angel obtained these documents. Also worthy of note are Simon Tyssot de Patot's Voyages et Aventures de Jacques Massé (1710), which features a Lost World, La Vie, Les Aventures et Le Voyage de Groenland du Révérend Père Cordelier Pierre de Mésange (1720), which features a Hollow Earth, and Nicolas-Edmé Restif de la Bretonne's La Découverte Australe par un Homme Volant (1781) notorious for his prophetic inventions. Most notable of all is Mary Shelley's Frankenstein, first published in 1818. In his book Billion Year Spree, Brian Aldiss claims Frankenstein represents "the first seminal work to which the label SF can be logically attached". It is also the first of the "mad scientist" subgenre. Although normally associated with the gothic horror genre, the novel introduces science fiction themes such as the use of technology for achievements beyond the scope of science at the time, and the alien as antagonist, furnishing a view of the human condition from an outside perspective. Aldiss argues that science fiction in general derives its conventions from the gothic novel. Mary Shelley's short story "Roger Dodsworth: The Reanimated Englishman" (1826) sees a man frozen in ice revived in the present day, incorporating the now common science fiction theme of cryonics whilst also exemplifying Shelley's use of science as a conceit to drive her stories. Another futuristic Shelley novel, The Last Man, is also often cited as the first true science fiction novel. In 1835 Edgar Allan Poe published a short story, "The Unparalleled Adventure of One Hans Pfaall" in which a flight to the moon in a balloon is described. It has an account of the launch, the construction of the cabin, descriptions of strata and many more science-like aspects. In addition to Poe's account the story written in 1813 by the Dutch Willem Bilderdijk is remarkable. In his novel Kort verhaal van eene aanmerkelijke luchtreis en nieuwe planeetontdekking (Short account of a remarkable journey into the skies and discovery of a new planet) Bilderdijk tells of a European somewhat stranded in an Arabic country where he boasts he is able to build a balloon that can lift people and let them fly through the air. The gasses used turn out to be far more powerful than expected and after a while he lands on a planet positioned between earth and moon. The writer uses the story to portray an overview of scientific knowledge concerning the moon in all sorts of aspects the traveller to that place would encounter. Quite a few similarities can be found in the story Poe published some twenty years later. Somehow influenced by the scientific theories of 19th century, but most certainly by the idea of human progress, Victor Hugo wrote in The Legend of the Centuries (1859) a long poem in two part that can be viewed like a dystopia/utopia fiction, called Twentieth century. It shows in a first scene the body of a broken huge ship, the greatest product of the prideful and foolish mankind that called it Leviathan, wandering in a desert world where the winds blow and the anger of the wounded Nature is; humanity, finally reunited and pacified, has gone toward the stars in a starship, to look for and to bring liberty into the light. Jean-Baptiste Cousin de Grainville's Le Dernier Homme (1805, The Last Man). Historian Félix Bodin's Le Roman de l'Avenir (1834) and Emile Souvestre's Le Monde Tel Qu'il Sera (1846), two novels which try to predict what the next century will be like. Jane C. Loudon's The Mummy! : A Tale of the Twenty-Second Century (1836), in which Cheops is revived by scientific means into a world in political crisis, where technology has advanced to gas-flame jewelry and houses that migrate on rails, &c.
Louis Geoffroy's Napoleon et la Conquête du Monde (1836), an alternate history of a world conquered by Napoleon. C.I. Defontenay's Star ou Psi de Cassiopée (1854), an Olaf Stapledon-like chronicle of an alien world and civilization. Astronomer Camille Flammarion's La Pluralité des Mondes Habités (1862) which speculated on extraterrestrial life. Edward Bulwer-Lytton's The Coming Race (1871), a novel where the main character discovers a highly evolved subterranean civilization. The European brand of science fiction proper began later in the 19th century with the scientific romances of Jules Verne and the science-oriented novels of social criticism of H. G. Wells. Verne's adventure stories, notably A Journey to the Center of the Earth (1864), From the Earth to the Moon (1865), and Twenty Thousand Leagues Under the Sea (1869) mixed daring romantic adventure with technology that was either up to the minute or logically extrapolated into the future. They were tremendous commercial successes and established that an author could make a career out of such whimsical material. L. Sprague de Camp calls Verne "the world's first full-time science fiction novelist." Wells's stories, on the other hand, use science fiction devices to make didactic points about his society. In The Time Machine (1895), for example, the technical details of the machine are glossed over quickly so that the Time Traveller can tell a story that criticizes the stratification of English society. The story also uses Darwinian evolution (as would be expected in a former student of Darwin's champion, Huxley), and shows an awareness, and criticism, of Marxism. In The War of the Worlds (1898), the Martians' technology is not explained as it would have been in a Verne story, and the story is resolved by a deus ex machina. The differences between Verne and Wells highlight a tension that would exist in science fiction throughout its history. The question of whether to present realistic technology or to focus on characters and ideas has been ever-present, as has the question of whether to tell an exciting story or make a didactic point. [[File:Sortie de l'opéra en l'an 2000-2.jpg|thumb|Leaving the opera in the year 2000, hand-coloured lithograph by Albert Robida (late 19th century)]] Wells and Verne had quite a few rivals in early science fiction. Short stories and novelettes with themes of fantastic imagining appeared in journals throughout the late 19th century and many of these employed scientific ideas as the springboard to the imagination. Erewhon is a novel by Samuel Butler published in 1872 and dealing with the concept that machines could one day become sentient and supplant the human race. Although better known for Sherlock Holmes, Sir Arthur Conan Doyle also wrote early science fiction, as did Rudyard Kipling and Bangla science fiction writers such as Roy Rodgers and Begum Roquia Sakhawat Hussain, who wrote the earliest known feminist science fiction work, Sultana's Dream. Another early feminist science fiction work at the time was Charlotte Perkins Gilman' Herland. Wells and Verne both had an international readership and influenced writers in America, especially. Soon a home-grown American science fiction was thriving. European writers found more readers by selling to the American market and writing in an Americanised style. In the last decades of the 19th century, works of science fiction for adults and children were numerous in America, though it was not yet given the name "science fiction." There were science-fiction elements in the stories of Nathaniel Hawthorne and Fitz-James O'Brien. Edgar Allan Poe is often mentioned with Verne and Wells as the founders of science fiction. A number of his short stories, and the novel The Narrative of Arthur Gordon Pym of Nantucket are science fictional. An 1827 satiric novel by philosopher George Tucker A Voyage to the Moon is sometimes cited as the first American science fiction novel. One of the most successful works of early American science fiction was the second-best selling novel in the U.S. in the 19th century: Edward Bellamy's Looking Backward (1888), its effects extending far beyond the field of literature. Looking Backward extrapolates a future society based on observation of the current society. Mark Twain explored themes of science in his novel A Connecticut Yankee in King Arthur's Court. By means of "transmigration of souls", "transposition of epochs – and bodies" Twain's Yankee is transported back in time and his knowledge of 19th century technology with him. Written in 1889, A Connecticut Yankee seems to predict the events of World War I, when Europe's old ideas of chivalry in warfare were shattered by new weapons and tactics. American author L. Frank Baum's series of 14 books (1900–1920) based in his outlandish Land of Oz setting, contained depictions of strange weapons (Dorothy and the Wizard in Oz, Glinda of Oz), mechanical men (Tik-Tok of Oz) and a bevy of not-yet-realized technological inventions and devices including perhaps the first literary appearance of handheld wireless communicators (Tik-Tok of Oz). Jack London wrote several science fiction stories, including The Red One (a story involving extraterrestrials), The Iron Heel (set in the future from London's point of view) and The Unparalleled Invasion (a story involving future germ warfare and ethnic cleansing). He also wrote a story about invisibility and a story about an irresistible energy weapon. These stories began to change the features of science fiction. Edward Everett Hale wrote The Brick Moon, a Verne-inspired novel notable as the first work to describe an artificial satellite. Written in much the same style as his other work, it employs pseudojournalistic realism to tell an adventure story with little basis in reality. Edgar Rice Burroughs (1875–1950) began writing science fiction for pulp magazines just before World War I, getting his first story Under the Moons of Mars published in 1912. He continued to publish adventure stories, many of them science fiction, throughout the rest of his life. The pulps published adventure stories of all kinds. Science fiction stories had to fit in alongside murder mysteries, horror, fantasy and Edgar Rice Burroughs' own Tarzan. Unless indicated otherwise, the text in this article is either based on Wikipedia article "History of science fiction" or another language Wikipedia page thereof used under the terms of the GNU Free Documentation License; or on original research by Jahsonic and friends. See Art and Popular Culture's copyright notice. This page was last modified 20:29, 25 December 2013.